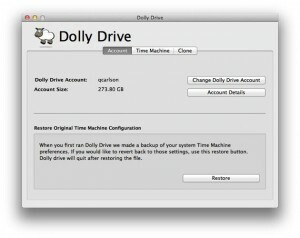 Dolly Drive lets you backup your Time Machine backups onto cloud. So the convenience of Time Machine + better data safety on cloud = pure awesomeness. Not only that, it can also clone your hard drive on an external drive if you want a local bootable backup for data redundancy. It also boasts syncing and mounted remote storage which you can store files on Dolly Drive’s servers as if on your local drive. How awesome is that? You no longer need to use three separate applications to do all that. All you need now is one software suite and you will be set. Read full review below or sign up now. Everybody knows that. Well, at least everybody with a Mac. Ever since OS X Leopard was introduced, Apple gave us Time Machine, which is basically really awesome and simple backup software that will run silently behind the scene and backup your files to an external hard drive. I’ve been an avid user and huge fan of it since it came out. But what happens when a disaster strikes and you also lose your external hard drive? Or somebody steals it? I know I have been repeating about it numerous times here but such things could really happen. It happened to me. Long story, so I wouldn’t go there. But I didn’t lose all my data. None at all. Dolly Drive got me covered for that. In fact, I was able to recover all my data back as soon as I get a new Macbook. Why? 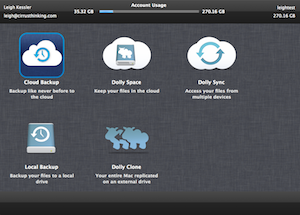 Because Dolly Drive (from $3 per month) brings your Time Machine backups onto the cloud. Dolly Drive has two main offerings: Individual and Family. Each has 6 storage plans. Honestly, with such wide array of options, I feel a bit confused to pick one from them. But if you really look carefully, the difference is all in storage space. Small (from $3 per month) – You will get 50GB of online storage, and additional 5GB every month as long as you remain as a customer. Basic (from $5 per month) – 100GB of online storage space and 5GB additional every month, which is more than enough for most of your data if you don’t store apps and videos. 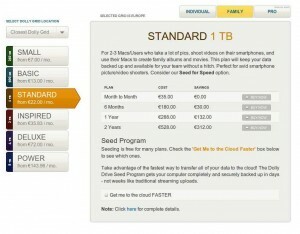 Standard (from $7 per month) – 250GB of storage and additional 5GB every month. It’s enough to backup almost everything you have. Inspired (from $13 per month) – 500GB of storage. No additional storage will be given monthly. Most Macs come with 500GB storage and so this is perfect if you want to backup your whole Mac, apps and everything. Deluxe (from $22 per month) – 1TB of online storage. You might not need this much storage unless you have tons of photos and perhaps videos. Power (from $40 per month) – 2TB of online storage. This is plenty even if you are a photographer or just have loads of data. Small (from $7 per month) – 250GB of storage, and stated that it’s best for no more than 2 Macs. Basic (from $13 per month) – 500GB of storage and for 3-4 Mac users with about 75GB each of files. Standard (from $22 per month) – 1TB of storage and it’s suitable for 2-3 Mac users with quite a fair bit of data. Inspired (from $35.83 per month) – 2TB of storage and for 3-4 Mac users. The pricing is a tad odd though. Deluxe (from $72 per month) – 4TB of online storage will be best suited for small companies or multiple Mac users creating a lot of data regularly. Photo studios, videographers and multimedia creators will rejoice. Power (from $143.96 per month) – Massive 8TB of online storage, best suited for power users, small businesses and heavy multimedia users. All plans for both Individual and Family are entitled to discounts if you sign up for 6 months to 2 years. 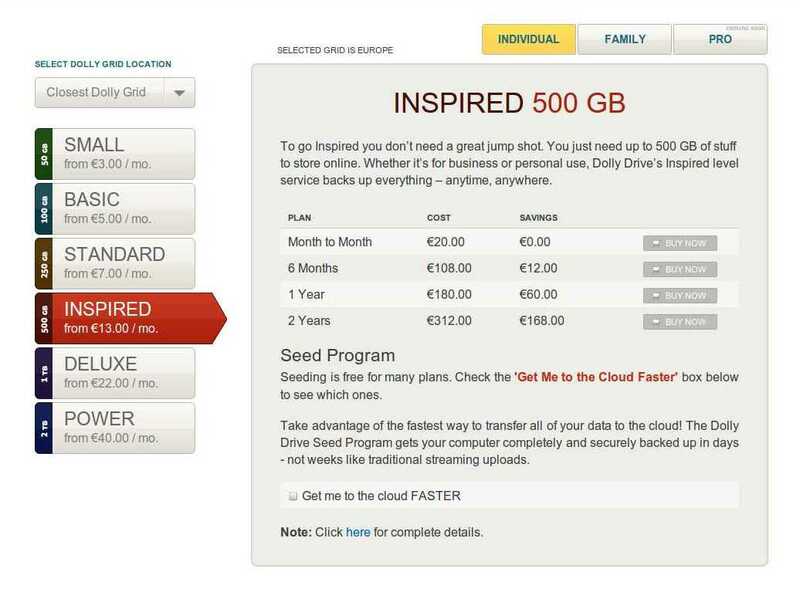 There is also “Hard Disk Seeding” service which will set you back $50 on lower priced plans and free on higher plans. Basically, Dolly Drive will send you a hard drive and you can load your data onto it then send it back to use it as initial seed backup. It is useful especially if you have loads of data to backup. Dolly Drive also has Pro plans which are yet to come, and seems like they will cater for business needs with more features and storage. There is no word on when Pro plans will be available. Currently, Dolly Drive is doing free trial for 100GB storage. There is no word on how long that trial will last so I would advise you to take up the offer while it’s still around. US and European Grids. If you live in Europe, then don’t be afraid of having slow speed when you upload to Dolly Drive. You can easily choose which network you want to store your files on. For Europe network, Dolly Drive has its data center in Rome. Automated and Scheduled Backups. 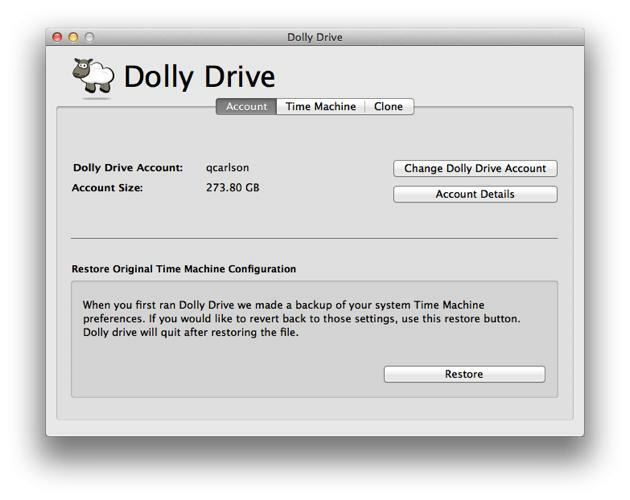 Just like Time Machine, Dolly Drive supports Time Machine’s settings of automated and scheduled backups, as frequent as every 1 hour. Manual Backup. If you are on a trip or would prefer to do backup when you feel like it, then you can switch off automated backup and conduct manual backups whenever you feel like it. Speed Control. You can actually control your backup speed if you like, so that you won’t be using too much bandwidth when you are working, and use full speed when you are sleeping. Dolly Clone. If you have used SuperDuper or Carbon Copy Cloner, then you would know what this feature does. Dolly Clone is also freely available from Dolly Drive even if you stop using their online backup service. Basically, it will let you create bootable clone of your entire Mac installation onto an external hard drive. Once initial cloning is completed, it can also perform incremental updates to cloned drives. Dolly Sync. This is exactly what it sounds like – a syncing feature. It works same as Dropbox and Google Drive. Enabling this will create Sync folder on your Desktop, and anything you drop into the folder will get synced to Dolly Drive’s servers and any other computer on which you have installed Dolly Drive and enabled Dolly Sync. Dolly Space. This is a Finder-mountable remote volume which requires you to install OSX FUSE (which allows non-standard volume types to be mounted). Basically, Space is Internet-hosted drive where you can store files remotely. Unlike Sync, it won’t leave local copies of files and all are stored remotely. You cannot browse your backup files through Dolly Space, but only through restoration options. Space alloted to to Sync and Space can be changed upon request. iOS apps. iDolly app will let you access your Space and Sync files, as well as view your backed up files on your iOS devices. Dolly Drives secure your data by using secured AES-256 bit encryption during transmission as well as on their servers. All of their servers are located in data centers across US and Rome with security protocols in place. Not only that, unless you grant them permission to access their data (literally) by Dolly Drive support staff (for support purposes). They cannot just click on your data and browse through them. A permission (not the kind you send an email and say “I permit you” but a real mechanism is in place in the software) is always required from data owner. Customer support is where Dolly Drive shines. Not only do they have comprehensive video library containing a vast amount of video tutorials on how to do things, they also have a pretty solid knowledgebase. There is also a discussion forum and support desk for you too. If you are new to Dolly Drive and don’t know how to setup, you just have to contact them via email or phone and they will arrange a time to help you out via screen share, where they will show you how to do things step by step, without any cost to you. How awesome is that? My experience with them have been very smooth. I actually don’t need a step-by-step spoon feeding to set it up (it’s darn easy, trust me) but I requested for it anyway for review purposes. Currently, Dolly Drive is offering 30 days free trial for 100GB space and you don’t even need to enter credit card details. It just needs username, first name, last name, email address and password. Then you can immediately download Dolly Drive software and start enjoying the trial. If you choose to buy a plan, then you will need to choose a plan first then enter your billing details as well as credit card information. There is no PayPal payment option, which is a bit inconvenient if you want to use PayPal. Honestly, I also feel like Dolly Drive is offering too much options, so much so that it can even make you feel confused. But then, the more choice there is, the better it is for users. Right after that, it’s straightforward affair of installing Dolly Drive on your Mac, and configuring the settings. 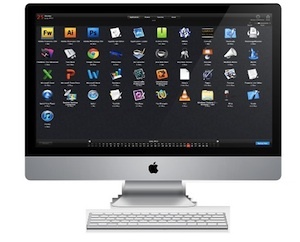 Dolly Drive interface is inspired by Mac interface, and it will let you access Dolly Drive functions through big icons. When you go into Cloud Drive icon, it will let you see all your backed up files. It will even show respective application icons for each file formats and how many files you have backed up. So basically, you can view backup files by applications. Also if you wish, you can browse through files using calendar. Browse tab will let you see folder hierarchy of your backed up folders, either in list or big folder icons. Restoring is very easy by clicking on “Restore” button and then choose the files or folders you want to restore. If you want to make a clone drive using Dolly Drive (which creates bootable clone of your hard drive to an external drive), then go to Dolly Clone under Dolly Drive. From there, you just have to choose source and destination drives then the software will take care of you. Do keep in mind that your destination drive must have larger capacity than source drive to create a clone. And your destination drive will be wiped out and reformatted to be prepared as a clone drive. When you enable Dolly Sync, it will create DollySync folder on your Desktop, where you can put any files there to be synced. For Dolly Space, after you enabled it, you will have to install OSX FUSE which enables you to mount non-standard volumes. Then you will find Space in Finder. You can access files and store files to your Space remote-volume directly. 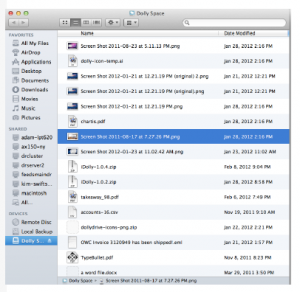 If you are a Mac user, then Dolly Drive is something you should give a thought about. Sure there are other competitors like CrashPlan and Backblaze, but none of them have Time Machine integration like Dolly Drive. Dolly Drive may not give you unlimited storage like CrashPlan does, and it doesn’t offer a lot of advanced features such as advanced scheduling and throtling features. But it packages syncing, mounted remote storage and cloud-based online backup of your Time Machine backups in one neat offering. The interface is pretty amazing too. For me right now, Dolly Drive works pretty darn well on my Macs and I have no plan to switch. I love CrashPlan but now it’s mainly used for Windows and Linux computers. If you are really thinking about giving Dolly Drive a go, you have all my support. Not responsive, evasive support. App is buggy and suffers from lack of UX awareness. Use them for time machine, must have for all OSX users!